Starting your own business need lots of planning and management. It does not matter what type of business you are starting. You have to prepare yourself for the challenges it involves as well as for the risk when you start your own business. It is very common nowadays that people choose to work for themselves rather than for someone else but starting a business is not as easy as it sounds. 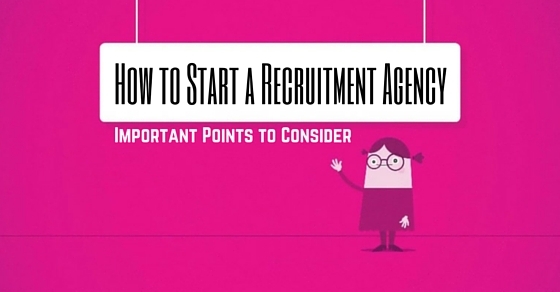 You must know what recruitment agency is before you decide to start one. Recruitment agency generally works as a mediator between company and candidates. Agency chooses candidates according to company requirement, interview and placement. Decide beforehand in which field you want to work like medical, engineering etc. When you start your homework you need to gather all the information in advance, study structure of other successful recruitment agencies, their policies and market plans because when you have sufficient information and data, you can easily start your own work. Know the field you choose to start your recruitment agency. Requirement of each field differ from each other and you must choose one rather than creating a mess. You should know how it works because if you have sufficient knowledge then you can plan and design your blue print of actual work. It is important to know the process, as it prepares you for the coming challenges and risks. Working without proper knowledge is like a suicide in business world. For example: To start recruitment agency for teaching staff, you must know the criteria and procedure involved in hiring a teacher as well as need and qualifications required. Each and every business venture needs resources. Resources may vary for different businesses according to their need and expertise and you must know what resources are needed for the business you are starting. Resources provides mobility to the business, actual work starts only when you have sufficient resources and your resources can be anything depends on your business need. Recruitment agencies generally need clients, candidates for job, staff, offices and help. Resources required by a recruitment agency are limited but very important. You need money to make more money. Any business you start need money no matter what you are doing or where you are doing. To start recruitment agency you have to know how much money it requires. It is important to have capital when you plan your business. Capital helps in making it possible what was in blueprint. Actual work starts when you start in-flow of capital and you need to plan it in advance. When you plan your capital keep in mind that when you borrow capital you have to pay it back. So borrow it from trusted resources. Business involves risk because future is uncertain and you can predict what is going to happen in coming time. It is important to consider risk factor in advance; you can’t stop it but you can be prepared for it so that you can minimize the risk. People take risk in everyday life because you can’t stop living due to risk involved in it, same goes for business but be smart and consider all the possibilities and prepare backup plan in advance. Start the recruitment agency when you have experience how does it work because you will need experience to manage your business and to guide your staff. If you are just investing money then hire someone with experience and expertise, that way you have knowledge on how to run a recruitment agency. Experience always helps you at every step of your business. If you do not have experience you can merge associate with other existing recruitment company or work like a subordinate until you got the experience to run your own. Law plays important role in your business safety as well as in authentication. Research about any law related to recruitment agency, rules and regulation as well as instruction to start recruitment agency and any law related to hiring and advertising for employees. It is good to become familiar with income tax in and out, payrolls and deadlines. There are laws for risky work and dangerous working condition so if you are choosing recruitment agency for risky field then understand laws and rules very clearly. Contact local authorities and research guideline provided for recruitment authorities as well as employees insurance. It is good to be safe than sorry. In this time of globalization competition is everywhere. It is better to know how much competition you are going to face in your business because you will face difficulties if you have strong and experienced opponent and need more creative ideas to stay in the market. Do your research about market conditions, other agencies and trends common in the market. If you can do better and new, then you have more chances to stay in the market for long time. You have to research about the market climate first. Start your business only when there is demand for the business you are going to start and if the market climate is not suitable then change your business plan or change location of your business because if there is no demand then what you will do with your business. Starting a business according to demand is a smart choice. Staffing is another important part of starting your business. You need man power to complete the task as well as to manage your business. Choose staff according to your budget and how much you want to invest in your business. Always have reliable staff and inquire well about your men. Guide them and train to work according to your demands and choose staff from similar backgrounds. You need clients to start your business because you cannot stand in the market alone without any work. Build client by offering your services and making contact in the industry. It is hard to get clients when you are new so you can make few compromise like low cost and less service charge to make clients or you can associate with existing business or purchase franchise. This way you already have set of clients in advance. To start your business you need location to setup your business. Location plays important role in success of your business. Good location increase chances of success and work in your favor as well as you have better reach to the market and market have better reach to you that help in increasing flow of your business but check your capital before you choose location because prime location are more expensive than other locations. Also select location friendly to your business. Every business has its own profit margin. It depends on what you do. If you start to earn within 6-8 month of your business no matter how small your profit is, you can continue your business otherwise think again about your business idea and your strategy. You face losses because of your own way of working so it is better to plan your profit margins and how you are going to gain it. When you complete your homework then make plans. Planning involves how you are going to arrange capital and its investment. In business capital, management is very important as you have limited resource and capital to invest. Good planning result in successful business. How to Prepare Blueprints of your Work? Making blueprint is like solving problems on page. Blueprints helps in understanding your actual plan and you can better understand how you are going to run your recruitment agency. It also give you head start to work on because when you prepare blueprint then you are ready to implement it. Consider all the factors and involve expert guidance and your experience. Decide how you want to work (Alone, in partnership or recruiting network). It always help if you have someone to work with and to share your load but you can always go alone if you know you can handle the work and pressure. Most business venture start with partnership because that way you have more capital and men power as well as experience to work. Partnership in business has its own good and bad. You need to consider both in case you decide to work alone or in partnership. You can join already existing recruitment network. Recruitment networks give you less power but it also minimizes the risk factor. In network you work with others but when you go alone you have more to do than one can handle. Buying franchisee of popular brand will also work in your favor as you already have name in the market and you do not need any promotion to start your work. Starting a business alone is tedious task. Different task need to handle simultaneously. When you start alone you need reliable staff to work for you and have to struggle so be ready if you are starting alone. Go alone have so many problem like finance, management, guidance etc. If you are deciding to go alone then make plan for everything; decide and plan every minor details in advance, keep everything sorted and in order according to work and make sure you have every area covered equally. 1. Unrealistic plans, they never turn into a successful business. 2. High capital investment. It is not good to invest all your money in the starting of your business. Invest according to plan. 3. Unqualified staff. It is more dangerous than having less staff . 4. High risk. If the business idea involves high risk then drop the business idea. 6. Avoid late services. This can damage your image and it is more harmful when you are starting your business. 7. Never make rash decision as they can cost you your business most importantly your clients. When you start a business venture no matter what you do, you assign yourself to the hardship. Business requires strength and strong willpower as well as courage to take next step. There is risk in every step so plan strategically. To start a recruitment company you need to do your research and then make plan. Starting a recruitment agency is not hard but you need to prepare for both good and bad. Make effective plan and work on your niche so that you can have a benefit of experience. Recruitment agency needs work on ground than paper. Making new clients, setting interviews, selecting right candidates and taking responsibility of these candidates is huge task and keep in mind that no one want to work with you if you can’t give better services than other. It is better to plan than working directly as it gives you idea about how to work and manage it. A good plan always helps you and business. Unplanned business venture wastes so much energy and resources in organizing the thing and handling the work that, they have no time for managing risk and study market climate. So prepare well and elaborately.